Wow, this summer is a HOT one in Portland! Here at Pawsitive Steps PDX, we're being extra careful about walking your pups on hot days and making sure they don't become overheated. Sometimes, we may need to cut a walk a bit short due to the heat, and finish the visit with some play or cuddle time indoors instead. For many of us in the PNW who love to hike, camp and go on adventures with our pup pals, the increasing temperatures can definitely pose a problem. That's why we’re sharing tips for keeping your pet safe this summer and how to look for signs of heat stress or stroke. What is a heat stroke? Heat stroke happens when your dog’s ability to cool herself off becomes overwhelmed by too much heat. It can happen quickly and, if left untreated, it can cause organ damage and death. Keep in mind that dogs cannot sweat like humans can, and their ability to tolerate extreme heat is less than ours! How to recognize heatstroke. Your pet might become weak, wobbly and faint. In severe cases, your pet can have tremors or seizures. He may have a very rapid heart rate and his gums may appear bright red. If you think you are witnessing any of these signs, you should cool off your pet using our guidelines below and immediately seek emergency veterinary care. How to treat heatstroke. Move your pet out of the heat and wet your dog’s body with cool (not cold) water, then head IMMEDIATELY to your veterinarian. Most dogs will require IV fluids to treat for shock and support vital organs. Never cool a dog with ice cold water! This will actually make things worse, causing the blood vessels to constrict and keep their core body heat from escaping. Some breeds are at higher risk. While it can happen to any pet, some breeds are at higher risk. Brachycephalic (flat face) pets such as English Bulldogs and Pugs do not have the cooling mechanism that a longer nose provides. Underlying heart disease, collapsing trachea, laryngeal paralysis and even obesity can also predispose to heat stroke. How to prevent heatstroke? Avoid walking or exercise outdoors during the hottest parts of the day. Stick to shady areas if you can. Pay attention to your pup and carefully watch for signs of fatigue or overheating. Dogs will often overdo it, even in heat, so we have to be the ones to stop our pup’s activity before it becomes dangerous. Keep plenty of cool water with you when you take your dogs in the heat. And never, ever leave a pet in a car on a warm day! When the weather is hot, avoid walking your pup on man-made surfaces and opt instead for grassy areas and dirt trails. If you must walk on pavement (ie, to potty walk in the city) be sure to stay in shady areas, put boots on your dog or apply a pad protection wax to paw pads. Limit time on sidewalks and pavement to a quick potty break. 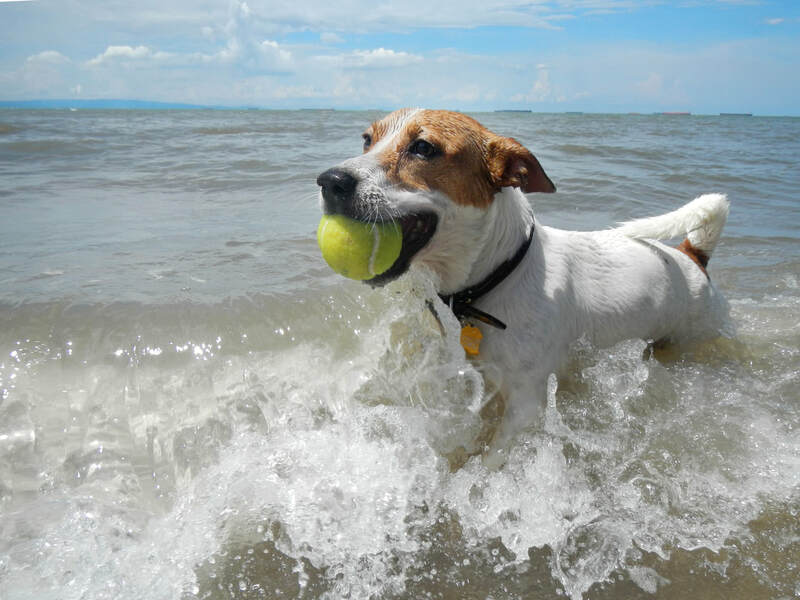 We’re wishing you a SAFE and happy summer with your pooch pals! DISCLAIMER: This article is for education only and is not intended as a substitution for professional veterinary advice. ALWAYS seek the help of your veterinarian IMMEDIATELY is your dog is in distress or suffers an injury. It’s not that I hate the 4th of July. I can recall, before having dogs, oohing and ahhing at the magical splendor of Roman Candles and heart-shaped firework art exploding across the night sky. ​After dogs, though. After dogs, the first onslaught of neighborhood pyrotechnic celebration sends our household into tremors. Our old rescued dog, Shelby, passed two years ago. He was half Australian Shepherd — a breed known for increased sensitivity to stimuli as well as for Epileptic seizures. He won out and got both. And the overbearing sensation of the house rocking as fireworks boom and clap and echo throughout the neighborhood leave him in such a panic that the ordeal, on more than one occasion, triggered a seizure. Shelby's level of fear and anxiety during the 4th of July holiday meant that we were glued to the house every evening the first week of July, so that we are able to execute The Annual Apocalypse Protocol. And since our youngest dog, Briley, is now developing firework and storm phobia at the age of six... well, it's time we brush up on our protocol skills. So, I present to you our own personal strategy for surviving the Firework Apocalypse. It also helps to just sit with the pups, breathing deeply, exuding calm, quiet, happy energy. Dogs really do pick up on our vibes, so if we act nervous or stressed about them being nervous or stressed, they become — you got it — more nervous and stressed. So just chill out with your furpeeps. Do some yoga stretches next to them. Give them something to chew on or play with that may distract them. And if you cannot be home during a time you know the terrifying fireworks will be popping, leave a few of your worn shirts and socks around your pet’s bed so your scent gives him some added comfort. Just sensing your presence may be another step toward relief for a high-anxiety pup. 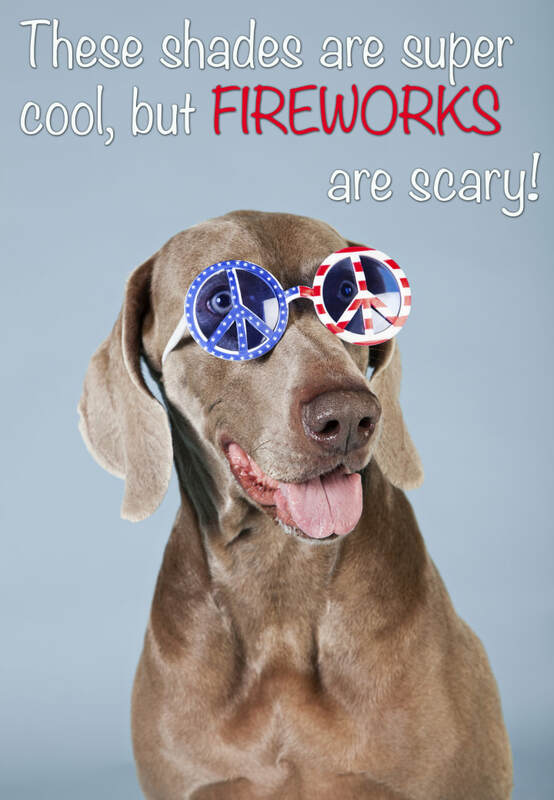 ​Most importantly, whether your pet is truly terrified of fireworks or not — please keep your pets safely indoors during the holiday week! Even normally chill pets may become frightened and escape fences or doors during loud noises and holiday commotion, which is why shelters see an increase of an estimated 30% more lost pets after the 4th of July holiday. It’s not worth taking the chance. Are you (accidentally) ruining walks with your dog? Let 'em stop and sniff! I need to take the dog for a walk. I also need to run to the grocery store, make dinner and do five billion loads of laundry. Okay, Ginger, we'll go for a walk. But you've gotta be quick! Hurry up, Ginger... come on! Then, without even realizing it, you're power walking and obsessing over your mental to-do list while you all but drag poor Ginger pup to keep up with you as you. But in your rush, you've forgotten something very important: to actually enjoy the walk! And you have also forgotten that how your dog experiences the walk is just as crucial as taking the walk itself. Stop and Smell the Roses... or Peed-On Trees! When we take a walk, we are often lost in our own minds. We're thinking of the past, the future, our meeting in two hours, that we need to call our mom about dinner on Sunday. Our dog, however, is fully and happily in the present moment, and it can be incredibly frustrating for them when we keep hurrying them onward when all they want to do is stop and SMELL THAT AMAZING LIGHT POST! You see, our dogs explore their world primarily through their noses, which is why Ginger wants to stop and poke her head into Literally. Every. Thing. along your route. While you might find the stop-and-go pattern frustrating and slow, your dog is simply participating in the moment and doing what she was designed to do. She is sniffing and learning so many interesting things about her environment, which is what truly engages her mentally and helps create a healthy, happy dog. According to Dr. Alexandra Horowicz, a canine researcher and the author of Being a Dog: Following a Dog into the World of Smell, dogs have 50 times as many scent receptors as humans! So while you may think your pup is just sniffing something gross and pointless, she is really hard at work, learning incredibly detailed information about her environment through her amazing olfactory senses. And when we don't allow our pup to explore the natural world with her nose, we are really doing our beloved companion a disservice. ...Birte Nielsen and colleagues published an important paper in December of 2015 titled “Olfaction: An Overlooked Sensory Modality in Applied Ethology and Animal Welfare.” They argue, compellingly, that we do animals a disservice by not acknowledging the impact of odor on their behavior and wellbeing. 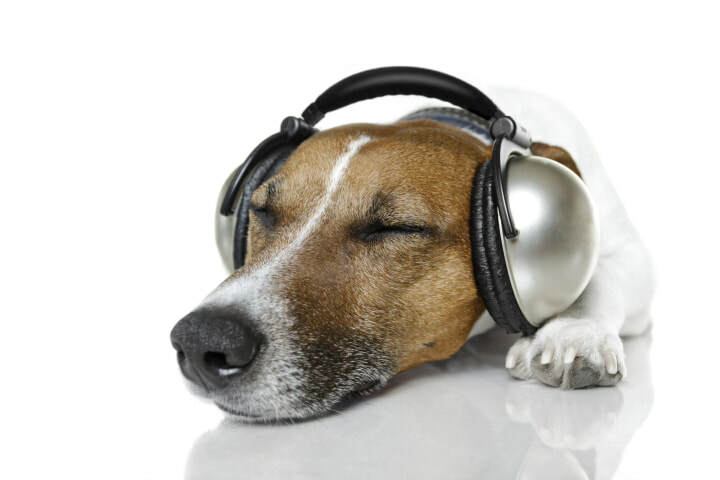 In short, your dog requires mental stimulation as much as she needs physical exercise. And one of the easiest and most satisfying ways you can help your dog enjoy mental stimulation is to simply let her sniff out her environment. After all, it is how she explores and makes sense of her world. That said, there is a time and place for everything. If your goal is to get in a good run with your pup pal, let her sniff around and enjoy her surroundings for a few minutes before launching into your jog. It's fine to keep her focused and at your side during the route, but then stop at the end and reward her with another stop-and-sniff session. And be sure to create time for more leisurely strolls with your pup pal, where she can sniff and wander to her heart's content. Meanwhile, take a hint from your pup pal and try to turn off the automatic reminders in your brain and tune in to the beauty around you, too. Being relaxed and in the moment together will bring happiness and wellbeing for both you and your canine companion! Man’s best friend. For those of us who share our hearts and homes with our canine companions, the phrase could not ring more true. After all, who else greets us with unabashed joy and enthusiasm every time we walk through the door? Who else loves us as unconditionally and loyally as our dogs? These days, our dogs live in our homes, travel with us and sleep in our beds--but it wasn’t always this way. Our unique bond with dogs spans thousands of years, slowly evolving over time. But how, when and where did it begin? According to a recent study conducted by scientists at Oxford University, “today's domestic dogs are a mixture of two ancient and once separate descendants of wolves” and “have been a part of human civilization for at least 12,000 years”. There are many theories about the origin of this symbiotic relationship, ranging from wolves feeding on garbage near human settlements to the idea of wolves and humans becoming acquainted while hunting large game. The latter theory is quite fascinating and serves up a good amount of evidence. This theory is explored in this NPR commentary, in which host Ira Flatow Mark Derr, author of "How the Dog Became the Dog: From Wolves to Our Best Friends" and Greger Larson, an evolutionary biologist and research scientist at Durham University in England. But what was that initial draw toward one another, especially given that humans and wolves were competing for the same game? According to Larson, while it may seem counterintuitive, it likely had to do with us sharing that very same purpose. Such a fascinating history for our furry friends! To read more, visit the full NPR story here.